Virginia Espino and Héctor Tobar will be honored for their "sustained and exemplary contributions to society" during a public reception on Friday, April 27. An award-winning journalist, Héctor Tobar is perhaps best known for his bestselling account of 33 Chilean miners who were buried alive for 69 days. Virginia Espino is an oral historian and filmmaker who has documented the civil rights struggles of California's Latinx community. These two talented storytellers, known for their dedication to telling the stories of those whose voices are muted, will be honored by the UC Santa Cruz Division of Social Sciences for their sustained and exemplary contributions to society during a free public reception on Friday, April 27, at 2 p.m. in the La Felix Room at the Seymour Marine Discovery Center. The public is invited to join the celebration; please register here. Tobar and Espino are recipients of the Division of Social Science's 2018 Distinguished Alumni Award. 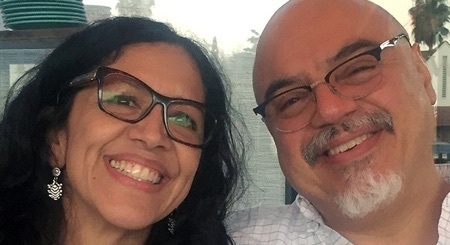 This marks the first time two award recipients were selected; Tobar and Espino, who met at UCSC, are married and the parents of three children. "Héctor Tobar and Virginia Espino are change agents," said Katharyne Mitchell, dean of the Division of Social Sciences. "Through their work and their commitment to truth and justice, they have empowered individuals, educated the public, and helped create a more fair and compassionate society. It is an honor to recognize their contributions and celebrate their achievements, especially during UCSC's Year of Alumni." Tobar, a 1988 graduate of Oakes College with degrees in sociology and Latin American Studies, is a Pulitzer Prize-winning journalist who has written for the Los Angeles Times, The New Yorker, LA Weekly, and other publications. His book, Deep Down Dark: The Untold Stories of 33 Men Buried in a Chilean Mine and the Miracle That Set Them Free, became the definitive account of the 2010 mining disaster that captivated the world. Based on exclusive interviews with survivors, Deep Down Dark was a National Book Critics Circle Award finalist. Tobar's other books include the novel The Tattooed Soldier and the nonfiction Translation Nation: Defining a New American Identity in the Spanish-Speaking United States. The son of Guatemalan immigrants, Tobar is an associate professor of Chicano/Latino Studies, English, and literary journalism at UC Irvine. Espino, a 1987 graduate of Merrill College with a degree in psychology, is a historian who has documented the struggle for social change. Her investigation of the coercive sterilization of immigrant women from Mexico at Los Angeles County General Hospital in the 1970s inspired the Emmy-nominated documentary No Más Bebés/No More Babies. Espino conducted oral histories with the women when she was in graduate school, and then served as producer and lead historian on the film, which aired on PBS in 2016. Espino teaches in the Chicana and Chicano Studies Department and in the Labor and Workplace Studies program at UCLA. The reception will include the screening of a clip from Espino's film, as well as the reading of an excerpt from Deep Down Dark. The Social Sciences Distinguished Alumni Award is given annually to a graduate of the division whose career is characterized by sustained and exemplary contributions to society through research, practice, education, policy, or service. Past recipients include marriage equality advocate Kris Perry (Merrill College '86, sociology and psychology), Pulitzer Prize winner Dana Priest (’81, politics, Merrill), and NPR science correspondent Joe Palca (’82, psychology Ph.D.). As part of a 2015 feature about alumni authors in the UC Santa Cruz magazine, Tobar wrote that he arrived on campus as a pre-med major but "quickly switched to the study of Latin American history, and to the theories of injustice and social change. Writing became my passion, in part because I was often in small classrooms where my professors worked hard at critiquing and editing my papers. UC Santa Cruz made me a thinker and a writer." Although Tobar and Espino met on campus, they didn't connect until years later in Los Angeles.